I've been seriously looking at the Google Play Store for my source of Movies & TV viewing. The range is great - and the prices usually fair. There is one catch in the system though. HD doesn't mean HD. 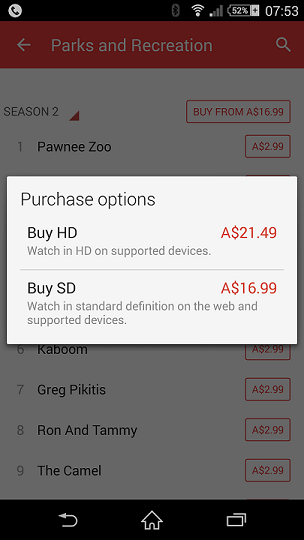 When you go to purchase something - you get two options - SD or HD. They usually differ in price - the HD item being a few dollars more than the SD version - which makes some sense - as it requires more bandwidth and storage for the HD version. So - even if you buy HD - you can't watch HD in your web browser. So what does play HD? So what does Google actually mean? 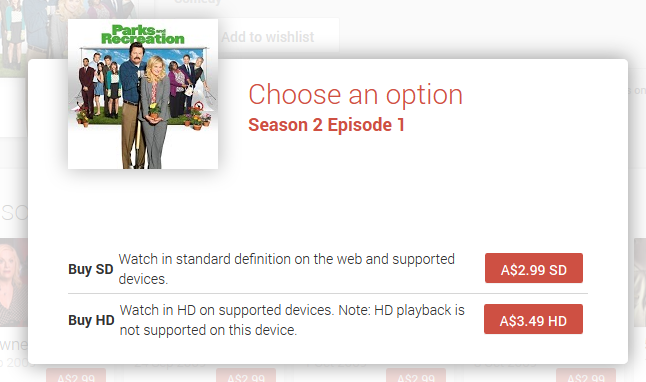 For the moment, it seems that purchasing in HD format only gives more of your money to Google. My conversations with Google Support over the phone seem to indicate that the only 'supported device' that will play HD is the Chromecast. Thankfully, Google seem to be quiet happy to refund your purchases if you point out that you're unable to watch them in HD on your PC - being the reason you purchased them in the first place. I got caught out on this again with my purchase of Parks & Recreation as shown above - and only being able to watch it in 480p - and the video quality looks awful - even for 480p. So, we have more refund requests waiting. Play Store is a great idea, and implemented well - but the phoney restrictions on quality vs devices cripple its usefulness. It's still easier and better to download via a torrent and get a properly formatted and encoded 720p video that you can do anything you wish with - and more importantly, watch on any device.